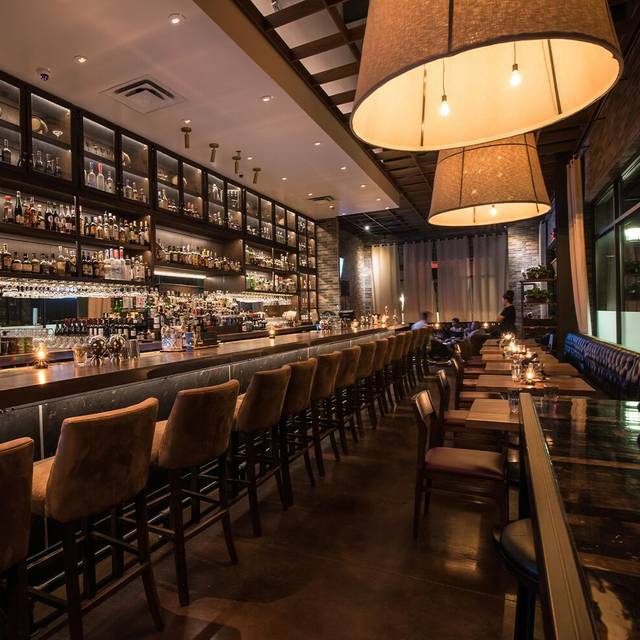 You must make reservations at least 5 minutes in advance of the time at Bottled in Bond. Dallas Tollway &amp; Lebanon Rd. Catering available as a large order takeout/pick up. Please contact the store for special event & catering menus. A minimum of 72 hours advanced placement is required for special menu items. Please contact us to book your private event! Whether an intimate gathering of close friends in a cozy corner or a larger bash that requires the entire venue we would love to work with you to make your evening memorable. PLEASE NOTE: Bottled in Bond is an 18+ environment. My gf and I decided to check this place out. The bar is very nice. Amazing selection of whiskeys and other things. The bartender was very good, and the drinks tasted great. Although we only ordered a few appetizers, they food was very tasty as well. Great place, and we will be back! Really enjoyed our first visit here. The atmosphere and drinks were great! Looking forward to coming again and trying more of the menu items. Great service. Drink was ok. Food is very expensive. I love this place but I feel the good quality is not what it used to be. The food is outstanding as well as the drinks. The music and noise level is too loud for such a small place. Very good service, good food. Maybe fancier taste than you would expect in a pub setting. Good location to get to the Ford Center at the Star. Great food. great service. love the 18+ atmosphere. I wont be going back on a Friday night however or at least asking for a table as far as possible from the singer. It was very very loud and we were on a fun double date and couldn't really hear each other. We will absolutely be back! The cocktails are amazing, I would recommend going and sitting at the bar. We waited 45 minutes for a cheese board! Our waitress never returned to refill our water or check on us. We had to ask the hostess for water TWO. When we explained our lack of service, she said “your waitress is normally the best, she must have a demanding table”. Seriously, you’re going to blame it on customers? Unprofessional. The table next to us, sat down 45 mins after us, ate and left before we were even able to order dinner. Our food came out and the fries were cold. We sent them back and they did not remove them from our bill or give us any kind of discount for the poor service. Always a great experience!! Our favorite date night! The ambiance was spot on... as well as the service, food and alcohol offerings. We will return. Excellent cocktail selection. Happy hour was a good deal with a selection of $7 cocktails and small bites. Noise level was okay up until the live music started, then it was too noisy to carry on a conversation. In fairness, we were seated right next to the performer. Will definitely return. Recommend the Vieux Carre and the Cheddar Scallion Beignets. Hi Andy! Thank you so much for taking the time to review. We're so pleased you enjoyed your visit! We only have live music on Fridays from 7pm - 10pm so every other day the music stays pretty moderate. If you would like to join us on another Friday during live music feel free to put a note in when making your reservation that you'd like to be seated away from the performer and we will be absolutely happy to accommodate that request. Look forward to having you in as our guest again soon! We gathered for happy hour for drinks and appetizers. The staff is friendly and helpful. The drinks are excellent. My favorite apps are the bison meatballs and the deviled eggs. Our supper club group had an excellent evening at Bottled in Bond and would love to go back again one day. The ladies in the group enjoyed the Laters baby cocktail and the men all indulged in the Bourbon & Bacon flight. We were thankful for the cheese board as that is a tradition for our group. The ladies shared a trio of appetizers for dinner of which they were all delicious and the men were not diss appointed either with their burgers and Shrimp & Grits. Great ambiance, waiter and overall experience. The bartender Adam was great! He made delicious drinks and recommended the perfect food. Had a blast definitely be back. Music was on the other side of the restaurant and so loud we could barely hear one another. Took us 30 minutes to get our first drinks and nothing we spectacular. As always excellent. The food is top-notch, the service wonderful and the drinks are to die for. I called the restaurant stating I needed to make a reservation for that Sunday and the host directed me to make a reservation online at open table. I did and received two different confirmation emails and even a third email a day before as a reminder email. Our reservation was for 6 people all of whom were traveling from out of town for a birthday. We arrived at the restaurant, balloons, presents and all to find a sign posted on the door saying it was closed for a holiday staff party. In the middle of Jan???? Super disappointing and extremely inconvient. We had to scramble to find another place and ended up having to wait 30 minutes at the place we went to. The birthday girl really wanted to try this restaurant and was upset we didn’t know prior that it was closed. This inconvience really put a damper on our entire night. Not happy about this at all. Very disappointed. Service was extremely slow, even to get a glass of wine or champagne. The restaurant was not busy and they only had one bartender. The food came out at different times. The menu changed and the things that made BnB special are now gone. We were there for a birthday celebration and couldn’t get a toast in as all of our guests didn’t have a drink all at the same time. We have been here many times before and had a great experience. Unfortunately, we will not be going back. Picked this place for a date, at first it was kind of slow, begin to rethink my choice. But stuck with it and the place warmed up nicely! Could not have had a better expierence. We made it right by offering to simply add a chair to the end. It was our idea—the restaurant offered no solutions. The cocktails and appetizers were fantastic, but the entrees were merely mediocre at best. We may need to keep this place for drinks only and go to another restaurant for the entree. We like this is an over 18 place so no annoying kids and parents who can’t control them. Truly a hidden gem! Great service, knowledgeable staff, fantastic food and an amazing whiskey list! Will be back. Love the food love this service. Every time I go there the food is delicious. Great place, especially for a date. It’s a whiskey bar not a wine place but great quality and great menu ! Been a while since we have been back...new menu (or lack thereof) is unimpressive. Thank you so much for coming back in and checking us out! We certainly appreciate your concerns regarding the size of the menu. When you were in we were mid- menu change over and have now (as of a day ago) rolled out our new full fall/winter menu. We'd love to have you come back in and get your thoughts on some of the new additions! Thank you again. It was a perfect evening! I love this place! Great food & awesome drinks!! The food was delicious. This was our 2nd time here and we were very satisfied! They did a great job on our made-to-order cocktail and the appetizers and dinner was superb! The wine the waitress recommended was not my favorite but the food was really why we came. It is a little on the pricey side but it WAY better in my opinion than other comparable area upscale cuisine restaurants as far as quality and taste of food. The food is always good and it’s so cozy and warm inside. Definitely recommend making reservations on OpenTable. They also have a great happy hour. They were out of many drinks we wanted. The bourbons, and wines we all requested, they didn’t have. Made reservations for a low table. Got a high. The music was so loud (live and quite good), but had to shout to have a conversation. First timers - We’ll be back! Fun upscale bar with good food and extensive selection of spirits. The signature cocktails focus too much on garnishing and are overloaded with ice (i.e. Acapulco Gold). Stick with the basics like the old fashioned’s, although they not only upcharge for substituting another bourbon besides Evan Williams, they also tack on an upcharge fee, which is just annoying. 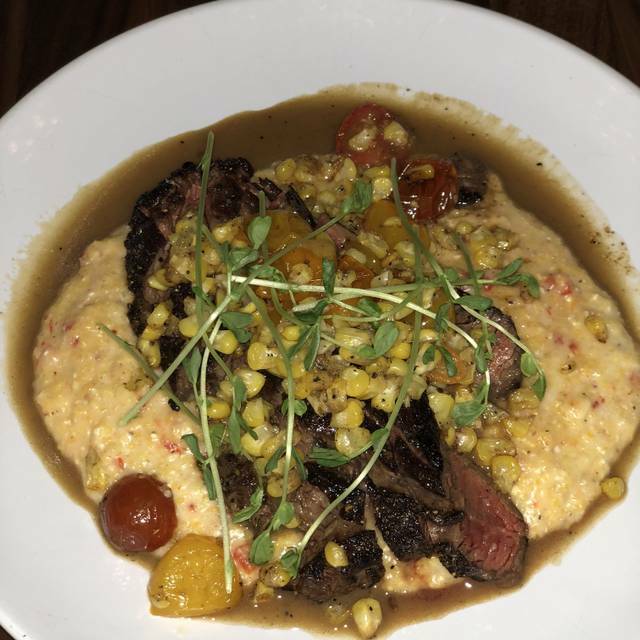 The wagyu hangar steak with pimiento cheese grits was incredible. Bison burger on a pretzel bun was good and spicy, although the bun was burnt. A few kinks need to be refined, although it’s good enough and close to home to give it another shot. First time here but it won't be my last. Quaint and intimate with live music on Friday night. It was a wonderful place to catch up with friends. The cocktails were tasty and the bacon and bourbon parings amazing!